International trade between different countries is an important factor in raising living standards, providing employment and enabling consumers to enjoy a greater variety of goods. 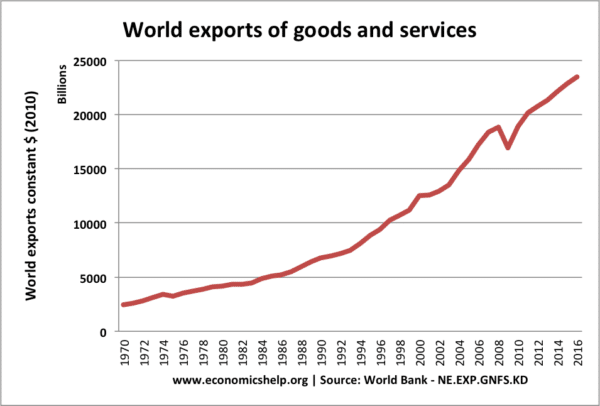 International trade has occurred since the earliest civilisations began trading, but in recent years international trade has become increasingly important with a larger share of GDP devoted to exports and imports. World Bank stats show how world exports as a % of GDP have increased from 12% in 1960 to around 30% in 2015. With an increased importance of trade, there have also been growing concerns about the potential negative effects of trade – in particular, the unbalanced benefits with some losing out, despite overall net gains. World exports of goods and services have increased to $2.34 trillion ($23,400 billion) in 2016. Some countries are naturally abundant in raw materials – oil (Qatar), metals, fish (Iceland), Congo (diamonds) Butter (New Zealand). Without trade, these countries would not benefit from the natural endowments of raw materials. A theoretical model for this was developed by Eli Heckscher and Bertil Ohlin. Known as the Heckscher–Ohlin model (H–O model) it states countries will specialise in producing and exports goods which use abundant local factor endowments. Countries will import those goods, where resources are scarce. The theory of comparative advantage states that countries should specialise in those goods where they have a relatively lower opportunity cost. Even if one country can produce two goods at a lower absolute cost – doesn’t mean they should produce everything. India, with lower labour costs, may have a comparative advantage in labour-intensive production (e.g. call centres, clothing manufacture). Therefore, it would be efficient for India to export these services and goods. While an economy like the UK may have a comparative advantage in education and video game production. Trade allows countries to specialise. More details on how comparative advantage can increase economic welfare. The theory of comparative advantage has limitations, but it explains at least some aspects of international trade. New trade theory places less emphasis on comparative advantage and relative input costs. New trade theory states that in the real world, a driving factor behind the trade is giving consumers greater choice of differentiated products. We import BMW cars from Germany, not because they are the cheapest but because of the quality and brand image. Regarding music and film, trade enables the widest choice of music and film to appeal to different tastes. When the Beatles went on tour to the US in the 1960s, it was exporting British music – relative labour costs were unimportant. Perhaps the best example is with goods like clothing. Some clothing (e.g. value clothes from Primark – price is very important and they are likely to be imported from low-labour cost countries like Bangladesh. However, we also import fashion labels Gucci (Italy) Chanel (France). Here consumers are benefitting from choice, rather than the lowest price. Economists argue that international trade often fits the model of monopolistic competition. In this model, the important aspect is brand differentiation. For many goods, we want to buy goods with strong brands and reputations. e.g. popularity of Coca-Cola, Nike, Addidas, McDonalds e.t.c. Another aspect of new trade theory is that it doesn’t really matter what countries specialise in, the important thing is to pursue specialisation and this enables companies to benefit from economies of scale which outweigh most other factors. Sometimes, countries may specialise in particular industries for no over-riding reason – it may just be a historical accident. But, that specialisation enables improved efficiency. For high value-added products, multinationals often split the production process into a global production system. For example, Apple designs their computers in the US but contract the production to Asian factories. Trade enables a product to have multiple country sources. With car production, the productive process is often even more global with engines, tyres, design and marketing all potentially coming from different countries. Trade tends to conjure images of physical goods import bananas, export cars. But, increasingly the service sector economy means more trade is of invisibles – services, such as insurance, IT services and banking. Even in making this website, I sometimes outsource IT services to developers in other countries. It may be for jobs as small as $50. Furthermore, I may export a revision guide for £7.49 to countries all around the world. 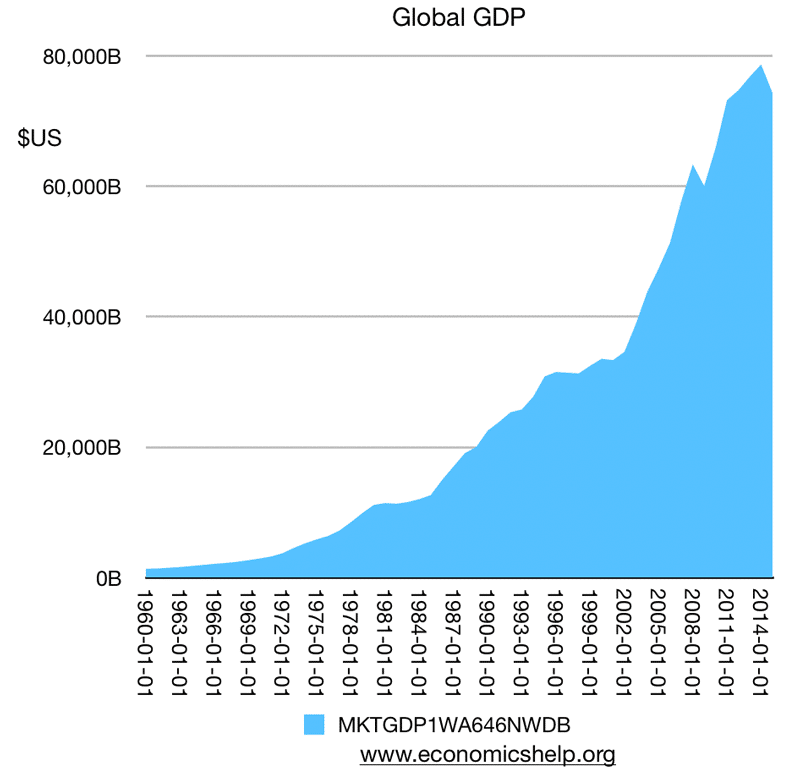 A global economy with modern communications enables many micro trades, which wouldn’t have been as possible in a pre-internet age. International trade has been an important factor in promopting economic growth. This growth has led to a reduction in absolute poverty levels – especially in south east Asia which has seen high rates of growth since the 1980s. Given the importance of free trade to an economy, it is unsurprising that people are concerned about the potential negative impacts. Infant industry argument. 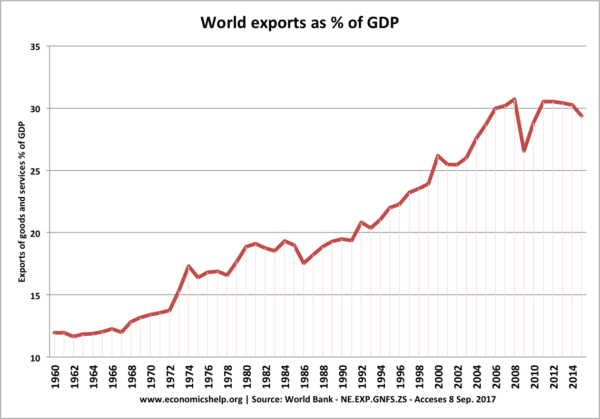 The fear is that ‘free trade’ can cause countries to specialise in primary products – goods which have volatile prices and low-income elasticity of demand. To develop, economies may need to restrict imports and diversify the economy. This isn’t an argument against trade per se, but an awareness trade may need to be ‘managed’ rather than just rely on free markets. See more at Infant Industry Argument. Trade can lead to cultural homogenisation. Some fear trade gives an advantage to multinational brands and this can negatively impact local produce and traditions. Supporters argue that if local products are good, they should be able to create a niche than global brands cannot. Displacement effects. Free trade can cause uncompetitive domestic industries to close down, leading to structural unemployment. The problem with free trade is that there are many winners, but the losers do not gain any compensation. However, free-market economists may counter that some degree of creative destruction is inevitable in an economy and we can’t turn back to a static closed economy. On the upside, if the uncompetitive firms close down, ultimately new jobs will be created in different industries. This entry was posted in trade. Bookmark the permalink. I am just trying to better understand the trade wars, the trade rules, the stock market, and the economic factors that impact me as an American. Most of us aren’t taught this from a global standpoint, even though what goes on globally effects the stock markets and our 401ks.